I thought moving across the country alone and working a 9-5pm job would give me lots of time to do things for myself. You know, like spending hours exercising, practicing meditation, making a dent in my reading list, and of course, blogging all the time. I would say I have been averaging a new post every 2 weeks, so you can probably guess where I’m at with my other goals. Being alone does give you a lot of time to think and reflect. I’m definitely learning a lot about myself. For starters, I came to the conclusion that I will like any ice cream flavor as long as there are nuts in it. Talenti’s pistachio gelato will forever have a special place in my heart and freezer. However, I now have to make extra room in both spaces because I have fallen in love with Christina’s Homemade Ice Cream‘s maple walnut flavor. 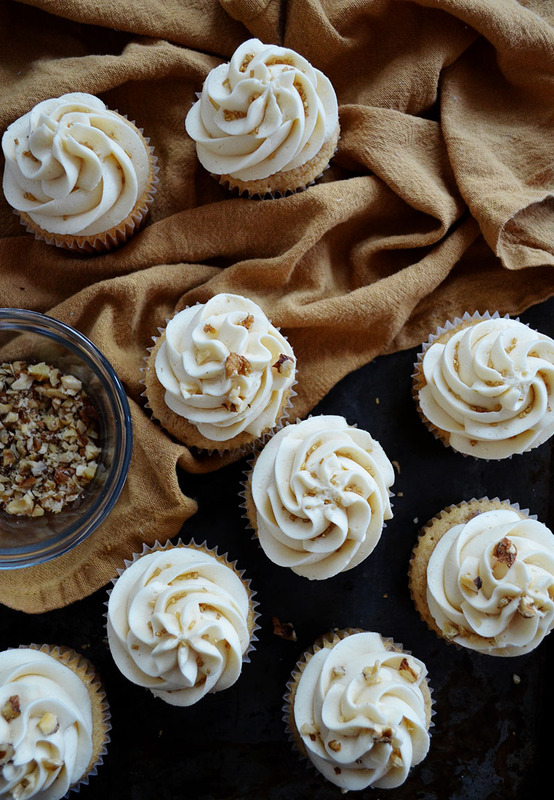 Their ice cream was the inspiration for these maple walnut cupcakes, and these cupcakes are one of the most delicious treats I have ever had! 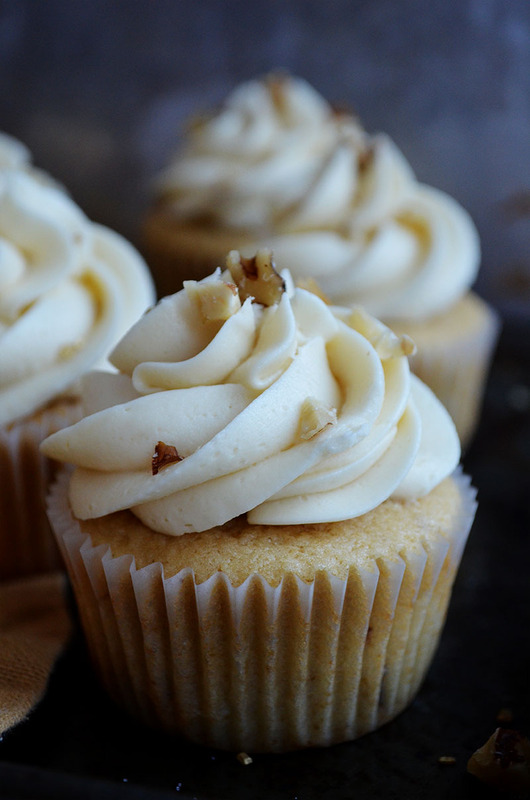 The cupcakes are made with finely chopped walnuts and brown sugar. Creaming the sugars and butter and not over mixing the batter once the dry ingredients are added makes these cupcakes delightfully light and soft. The cupcakes are also very moist, and the bits of walnuts give it a nice little bite. Allow me to get to the best part. 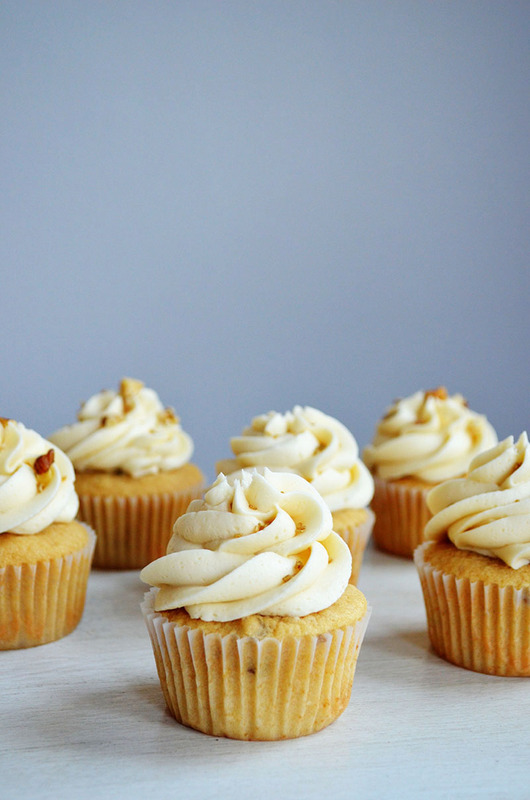 The most delicious maple syrup frosting. It is so spectacular and simple. Make sure to use pure maple syrup. It can be a little expensive, but trust me, it is absolutely worth it. I used Wilton’s 2D decorating tip to pipe on the frosting, then I sprinkled half the cupcakes with William-Sonoma’s gold sprinkles and the other half with finely chopped walnuts. Preheat the oven 350F degrees, and line standard sized muffins pans with 16 paper lines. In a large mixing bowl, mix together the butter and sugars until fluffy and smooth on medium-high speed, about 3 minutes. Reduce the speed to medium-low, then add the eggs, one at a time, and the vanilla extract. Slowly add the flour, baking powder, and salt, and mix until smooth, stopping once or twice to scrape down the sides of bowl with a spatula. Add the chopped walnuts, and slowly pour in the milk. Mix until just incorporated. Fill each liner three-quarters full, then bake until a toothpick comes out clean, about 18 minutes. Allow to cool in the pan for 15 minutes. Remove to a baking rack and cool completely. In a large mixing bowl, mix together the butter and sugar, adding the sugar one cup at a time, on medium-low speed. When the powdered sugar is mostly integrated with the butter, increase the speed to high and mix for 1 minute, stopping once to scrape down the bowl. Slowly pour in the maple syrup, then continue to mix for another 2 minutes, until the frosting is nice and fluffy. Spread or pipe over cooled cupcakes. For easy filling, pour the cupcake batter into a gallon-size ziplock bag. Snip off a corner, then squeeze the batter directly into the center of the liner. Store the cupcakes in an airtight container. These cupcakes are so beautiful and look delicious! I love maple flavored things too, I can imagine eating one (or a couple……..) of these with my morning coffee. I understand what you mean by sometimes we think we will have all this time but in reality time passes so fast. Posting once every 2 weeks is a big accomplishment! 🙂 I think of blogging as keeping a journal of everything delicious we make. Even if you’re writing in the journal once in a while instead of every single day, you’re still sharing great recipes and people will love reading them! I know I like reading yours every time you post! Thank you Sarah! I wish I could send you some. They are terrific in the morning…and afternoon…and evening.. (: I can’t stop eating them, so I brought them to work for my lab to enjoy. Yes! Maple Walnut is my favorite ice cream flavor too. And I think it definitely tastes better in New England than it does other places :-). These cupcakes look perfect!! Talenti, though. Mhm mhm mhm. Cupcakes look gorgeous. You’re a wiz with a frosting tip! Pinned! You are too kind Sarah! Thank you! Really beautiful cupcakes! I love the idea of maple frosting! These cupcakes are seriously so stunning. No words!! Pinned. You are too sweet Jocelyn! Thank you so much! Love these cupcakes? Are these mini ones? Or regular sized? Sometimes I can’t tell on photos. These are so cute! My hubby loves all things maple, I’ll have to try making a vegan version for him. They sound delicious! Thank you so much! They were so delicious!! My vegan friends would totally appreciate a vegan version of these cupcakes – please share the recipe if you do!! Wanna give it a try but I don’t like it too sweet! Will it affect if I reduce the sugar used for the frosting? Replace with maple syrup? Thanks! I’m so excited that you’re interested in giving this recipe a try! It’s one of my favorites! Unfortunately, reducing the sugar with more maple syrup won’t give you a nice firm frosting. I imagine that the frosting won’t hold very well together if there is too much liquid (i.e. maple syrup). I just made these and they are amazing!! I subbed half the vanilla extract for maple extract and used half the amount of butter for the frosting. Will definitely make again! !